This set of Geotechnical Engineering Quiz focuses on “Effect of Compaction on Soil Properties”. 1. Which of the following property of soil is improved by compacting the soil? Explanation: The main aim of compacting soil is to improve some desirable properties of the soil, such as reduction of compressibility, water absorption and permeability, increase in soil strength, bearing capacity. Explanation: As the structure of compacted clay is complicated and increasingly oriented, the structure of clay is always flocculated. Explanation: Due to higher strains, the flocculated structure of the compacted on the dry side is broken, giving rise to ultimate strength. Explanation: The shear strength of compacted clays depends upon dry density, moulding water content, soil structure, method of compaction, drainage condition and type of soil. Explanation: The structure of composite soils, after being compacted depend upon the relative proportion of coarse particles their structure can either be coarse grained skeleton structure or cohesive matrix structure. 6. What is the maximum dry density for a soil sample having sp. gr. of 2.7 and OMC=16 %? Maximum dry density, γd max = 1.885 g/cm3. Explanation: The manner of compaction influences the strength of soil sample compacted wet of optimum to a certain extent. Degree of saturation, S=89.79 %. 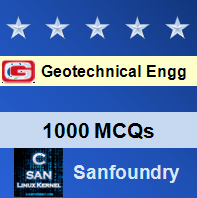 To practice all areas of Geotechnical Engineering for Quizzes, here is complete set of 1000+ Multiple Choice Questions and Answers.